New Zealand is one of the few countries in the world where pharmaceutical companies are allowed to advertise to consumers directly. I believe this is detrimental to our health and I call on the government to ban the practice immediately. Before you dismiss this saying that you never mention a drug to a doctor, let me remind you that your taxes are paying for these drugs and that these drugs are much more expensive because of the advertising spend of the manufacturers. So even if it is only your neighbour who is reading the adds and getting the prescriptions, you are paying for it. The issue is greater than the money. If the drug company with the best advertising campaign manages to have more prescriptions than their competitors in the same class of drug then they win. However, it is quite possible that you and I lose. If it is really unknown which drug is best then we lose, perhaps more of us die, if one of the other competitor’s drug is better than the one with the best advertising campaign. What is often missing is the comparative trial evidence from trials conducted by scientists with no ties to the pharmaceutical companies. * Kravitz RL, Epstein RM, Feldman MD, et al. Influence of Patients’ Requests for Direct-to-Consumer Advertised Antidepressants: A Randomized Controlled Trial. JAMA. 2005;293(16):1995-2002. doi:10.1001/jama.293.16.1995. Ben Goldacre in his book “Bad Pharma” describes this trial nicely. I think that book should be compulsory reading for all new medical students. The first thing to note is that cholesterol is NOT A DISEASE. It does not, should not, and cannot be treated. Sorry for shouting, but this is maddening – too often we are being fooled into thinking that some treatment is great for our health simply because it changes the levels of something in our blood (normally) that is merely associated with a possibly bad outcome. What really matters is that the drug lowers the incidence of the outcome without unduly increasing the incidence of other outcomes, and that the outcome in question really matters. 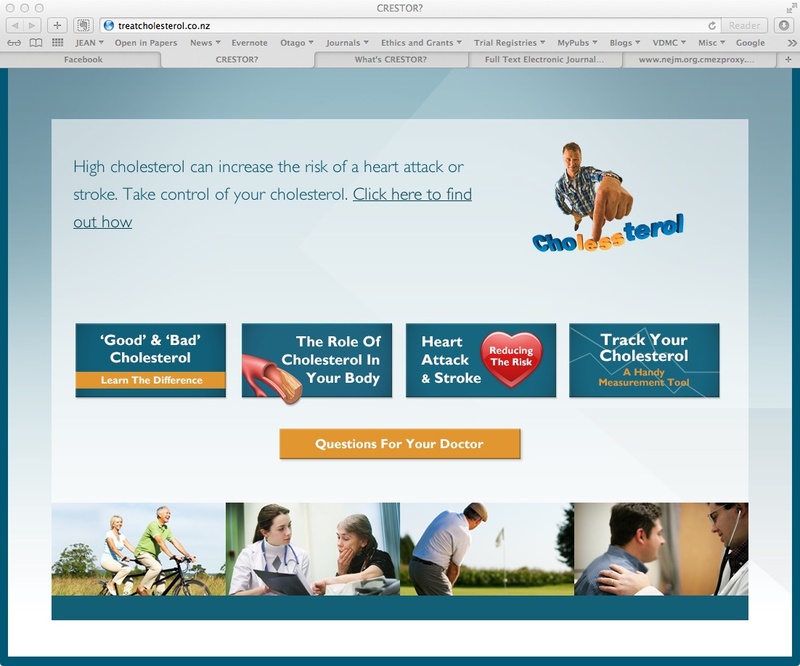 Clicking on any links took me to “crestor.co.nz” pages which were all about the drug Crestor. They were pages directly aimed at getting people to go to the doctor and ask for Crestor. This includes a “CRESTOR CHALLANGE – Try CRESTOR for Two Weeks Free” (http://crestor.co.nz/try-crestor-for-free.html ). They talk of a maximum monthly recommended retail price of $36 and provide a table in which they “Compare CRESTOR with the cost of other health products” – these being Omega 3 Fish Oils, Resveratrol, and Co-Enzyme Q10. Other than the obvious problem with “cherry picking” some products that are more expensive to compare with, this gives the impression that CRESTOR is simply another health supplement. It is NOTHING OF THE SORT (there I go shouting again). Crestor is a prescription medicine that contains a statin – rosuvastatin. This is stated in the small print on the bottom of the page (and elsewhere on the site). It is unfunded by the NZ government, hence the cost to the consumer. However, it requires a doctor’s prescription, hence the “Talk to your doctor to see if Crestor is suitable for you” message. Pharmac, New Zealand’s drug buying agency, have chosen not to fund Rosuvastatin. They fund three other statins which give the doctors plenty of choices. My guess is that the reason they fund these three is that they are all “off-patent” which makes them considerably cheaper than on-patent statins (Rosuvastatin is one). Also, they will not have evidence that Rosuvastatin offers a health benefit over and above the other statins. That is not to say that it is not appropriate for a doctor to prescribe Rosuvastatin in certain circumstances. They may do so when, for example, a patient has had an adverse reaction to other statins. This was a large study comparing Rosvustatin with a placebo. It was sponsored by the manufacturer (AstraZeneca) and the principal authors received grant support, lecture and consulting fees from AstraZeneca. The participants were healthy men older than 50 and women older than 60 with an LDL cholesterol of <130. That is a low level. The purpose of the trial was to see if Rosvustatin could prevent cardiac events in a normal cholesterol population. The trial reported a 44% reduction in risk in cardiovascular events in the Rosvustatin group. Sounds great. This is the problem with Relative Risk reduction when the incidence of the outcome is very small. The results showed 109 fewer events out of 8901 participants. In other words 82 people would have to be taken the drug for there to be 1 less event. In the meantime, all 82 are exposed to potential side effects. For example in the trial if 164 took drug, there would be two less cardiovascular events, yet 1 more diagnosis of diabetes. Also, unfortunately, the trial was terminated early with less than half of the expected events. From a statistical perspective this increases the risk that the results could be misleading. 2. Jones P et al Am J Cardiol 2003;92:152-160 (STELLAR). Another AstraZeneca funded and co-authored study. This time it is a metanalysis comparing effects of dose of various statins on cholesterol. There’s a few complexities here due to our purchasing and drug funding system. I do agree with the larger point about advertising though, it is an anomaly and probably shouldn’t be there but I’ll try and explain why I think it’s there and the constraints on this peculiar to NZ. It’s my understanding that advertising here (for certain drugs I’d call “lifestyle’ ones) is due to our drug funding system, where the government requires companies to tender for a contract to supply that drug. This means, as a whole, their ability to conduct trade in an fully open market for pharmaceuticals was gone but there was a trade-off there that they were allowed to market outside of this hence allowing drug advertising and participation in the market. I think doctors would be quite aware of what advertising is just as the rest of us are, wouldn’t sell them too short here. Findings from overseas are not necessarily applicable here due to major differences in how funding and supply are done. Notably this advertising we see here is pitched at patients, not the NZ doctor who has available funded drugs over many classes to prescribe. Our drug purchasing system means that generally, the most appropriate funded drug is prescribed as default if required and if a patient asks about a non-funded alternative they will have to pay full price as opposed to the normal $5 per 3 month script prescription fee. That’s rather a disincentive, compared with $108.00 for 3 months of the medicine advertised that you use to illustrate drug advertising. Also pharmacy and dispensing is split, and the doctor gets not a whit of benefit no matter how expensive the medicine is. So there is no financial incentive here. Nor is there any incentive to prescribe unecessarily or inappropriately, rather it would be medical malpractice to prescribe medicines to a person that isn’t appropriate to their condition. Just anecdotal, but when my husband had bloods taken and his cholesterol was out, we were given a diet sheet, not a prescription and told to come back in a few months for another test and review, That, to me, is appropriate initial approach given that medications do have risks and costs so best to be sure and try low level alternative interventions first. So no matter what the blandishments of a pharmaceutical company, their ability to influence is constrained by quite a few factors in clinical practice, and that includes consideration of best practice and what is most cost effective for patients. This is a bit complicated though, clinical trials are costly and it’s I’d have difficulty with the idea that we’d have to re-run them and retest something already tested when generally extensive review and such things as post-marketing survellience is conducted when approving drugs. Even when a drug is developed in a government funded body, there isn’t the funding or expertise there to take to market, so contracting with pharmaceutical companies it is. I’d prefer as a middle ground Ben Goldacre’s recommendation that all trials be published, as well as all raw data presented, so that approval bodies have as complete information available as possible. Thanks for that interesting comment Hemlock. Thanks for the comment about the trade-off. Not a reason I am comfortable with, but interesting. I don’t want to sell doctors short – I work with many, so it would be at my peril :). Of course they are aware of the marketing to them and they try not to be biased. However, I think it naive to think that the marketing has no effect on their prescription rates. If that really were the case then the pharmaceutical companies would not in New Zealand employ drug reps, provide morning teas to the surgeries, pay conference expenses etc etc etc. There is a literature on this, John. A pretty big literature. That DTC advertising is harmful is far from certain; there’s reasonable evidence of benefits. You might engage this literature before wanting that something be banned. Couldn’t agree with you more. As Ben Goldacre pointed out in his book, Bad Pharma “the pharmaceutical industry overall spends about twice as much on marketing and promotion as it does on research and development.” Imagine if they cut back on marketing – we could ahve cheaper drugs and/or more research. It is no coincidence that direct marketing to potential patients intensified after medical societies started restricting the junkets provided to doctors by pharmaceutical companies. I don’t want to sell doctors short either, but I don’t think we should necessarily assume they are more resistant to advertising than your average member of the public. For decades pharmaceutical companies would provide doctors with gifts, relying on the strong reciprocity this would create. With many of these opportunities to manipulate doctors directly, pharmaceutical companies are now trying to manipulate consumers/patients directly. Eric, the two papers listed on your website don’t seem to me to equate to “a pretty bif literature”, is there more? Ben Goldacre certainly includes the details for several concerning studies in “Bad Pharma”, for example when trained actors posing as depressed patients asked for a specific drug they were twice as likely to receive a prescription as those who did not mention a specific drug. I cited a few as example; I wasn’t going to write a Journal of Economic Literature survey piece responding to a blog post. Hit those in Google Scholar. The JLE piece has >70 citing it, so that would be where I’d start in a formal literature survey. I’m not the one calling for a very big policy move here, so I don’t think the burden of proof is on me. It would be an odd world in which I could demand bans on things, citing nothing, then insist that everybody else has to prove that it’s a bad idea to ban things I don’t like. I don’t pretend that my lit survey is exhaustive. Heck, it could turn out on an exhaustive survey that on net a ban is defensible. But calling for one before doing that kind of survey? The Goldacre finding you cite at the end is hardly surprising. People requesting a specific drug will fall into two groups: those who have a very good idea about what disorder they have and who have done a reasonable amount of research about it, and those who saw an add. People not mentioning a drug will be less likely to have engaged in any pre-consultation research. If we think that patients engaging in pre-consultation research have a better idea of what’s needed, then it would not be surprising if doctors took their specific requests as signalling that they’re more likely to need the drug. Agree with Goldacre about open data from trials and publishing everything – he’s right about that stuff. But note the Brekke and Kuhn finding that advertising to patients and lobbying of physicians are complements, not substitutes. Reduced physician lobbying makes DTC advertising less valuable to advertisers, not more.